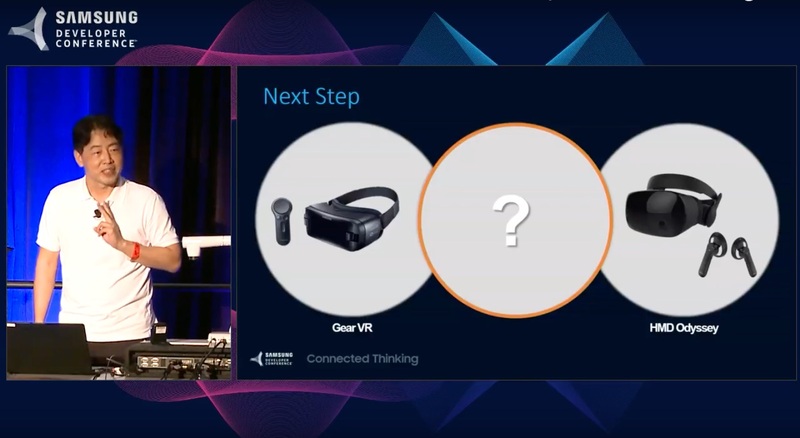 Taeyong Kim, VP of Samsung Electronics and Head of Graphics R&D, took the stage last month at the company’s annual developer conference to talk a little bit about the future of VR for the company. 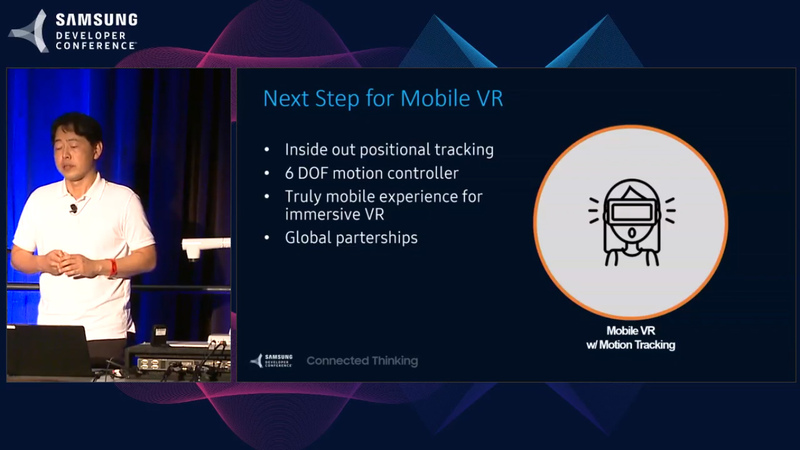 While no big reveals were expected for the talk, Kim actually mentioned to the crowd that the company is actively working on a standalone VR headset with inside-out tracking and 6 DoF controllers as their ‘next mobile VR product’. Kim says the company is partnering with Intel to bring inside-out positional technology to a standalone VR headset. Intel has been working on its own standalone headset called Project Alloy until it was scrapped back in September, possibly making for a fortuitous turn of events for the tech to live on in the hands of the well-seasoned Korean manufacturer. 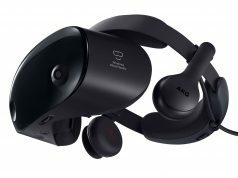 If Samsung pulls through with their own standalone VR headset with 6 DoF controllers, it would be in direct competition with Oculus’ upcoming Santa Cruz prototype, and to a lesser extent with the newly revealed Vive Focus. The future of Vive Focus is uncertain however, as HTC hasn’t said specifically if the headset is staying in China, or making its way to the West at some point. Either way, it won’t be running the Daydream app store and likely only have 3 DoF controllers despite its similar inside-out tracking capabilities. As for the growing divide between Oculus and Samsung; with the advent of the $200 Oculus Go mobile VR headset announced back at Oculus Connect, it will certainly be interesting to see if app marketplaces diverge, as for now Gear VR (powered by Oculus) is still very much a Samsung product. Kim says more details we arrive in the near future. Thanks go to Kent Bye for pointing out the source of this information in his latest Voices of VR podcast that deals with Samsung’s VR strategy going forward. Maybe someone with more of a technical background can answer this, but would it be possible to have independent inside out tracking on the hand controllers? It seems like the problem with inside out tracking is that when your hands leave the relatively limited field of view of the trackers placed on the HMD things get a bit wonky. So could the controllers themselves independently track their own positions and relay that information to the HMD? Or maybe there’s some other solution that I haven’t thought of but people in the industry are working on. Any thoughts? For the controller to track their own movement is not complicated (that’s what 6DOF does). But for the controller to be positioned accurately relative to the user headset and the other controller, it’s more complicated because you have to aggregate and ambiguate the positional datas from the 3 components in an accurate enough way that they are where they’re supposed to be. But another more conceptual approach is that “virtual hands” don’t need to mirror the user’s hand as precisely as the headset does, because while the headset is directly tethered to the head and eyes, hands are independent enough from your cognitive “processing center” (you often use your hand without looking at them) that an anticipated and smoothed virtual representation of your actual hand movements could work without causing discomfort/sickness. Which Leap Orion kinda does when moving your finger or hands rapidly or out of the tracking zone, and the Oculus controller or Vive wands don’t. You’d need significant onboard processing in the controllers, including sensors/cameras, making them much more expensive. I have no technical background in this area but, having red as much as I have, knowing as much as I know, I’d say: Yes!! All you need is a bit (or a LOT) of processing horsepower on the HMD part to keep everything tight and smooth. And if the controllers have independent 6DOF tracking, being in or out of sight of the HMD will be irrelevant. The controllers themselves will know where they are in space and relay that information to the HMD that will place them in your screen. EDIT: Come to think of it… I don’t see why the HDM would need that much more processing power. WIN MR devices are doing it now PLUS having the task of ALL the tracking because the controllers don’t have that ability. Maybe HDMs wont need to be that different from what we have now price and specs-wise. I don’t think it’s as simple as that for a number of reasons. Each controller would need at least two cameras offset from each other to obtain an acceptable level of tracking quality, and even then I don’t know how good it would really be, our hands have a much wider range of motion than our heads do, so keeping track of the world would be a significantly harder task. If the processing isn’t happening onboard the controller, that means streaming two fairly high quality video feeds to the headset from each controller. I’m not sure what kind of bandwidth requirement that would call for, but it would be a challenge to get working smoothly. Not to mention the power drain that would cost to the controllers. Now the headset needs to process not only the two images coming in from the headset, but the additional 4 from the controllers. Which probably means upping the internal specs significantly, or offboarding that process to the computer which then increases USB bandwidth requirements. All of this on top of the fact that cameras on a controller could still be occluded fairly easily if one of the cameras was blocked by anything. You guys need to think out of the box a bit. Why would you need cameras on the controllers? «Because it’s either that or extra hardware for tracking. It’s how it’s being done now…..» Ok, I get that. But that doesn’t mean those are the only ways to do it. Lasers (for example) have been used to take precision measurements for years. Why not fit a few low voltage, low range lasers in each controller and use the measurement data from those to keep track of the controller? Use 6: Bottom, Top, 4 on the controller ring. I know I’m just talking outta my a** here. I lack the technical know-how to know for sure if this is feasible or not but it’s just an example of ‘something’ that could, MAYBE, get it done. Such a shame (but a practical offer for agencies/artists/brands) that they’re all gearing their 2018 strategy towards VR events/conventions, instead of the bigger consumer/prosumer markets. Oculus Go is great for this purpose at 200€, well if your project is a fixed-positional mobile experience which is becoming less and less appealing for clients, but beside that, standalone VR headsets are beyond idiotic in terms of market positioning and device. If they’re partnering with Intel. I expect them to be running the MR platform. Yeah, these fully self-contained VR headsets with inside-out tracking aren’t really going to appeal to me fully until the have proper 6DoF tracking on both the headsets and controllers, and also at least match if not surpass all specs you can find on current high-end headsets like the Rift and Vive. Once they can do that I’ll be very interested. I prefer the PC attached VR device. I don’t feel the integrated CPU/GPU in the HMD can handle as much quality in the games/graphics as a nVidia 1060 or AMD 580, that costs $200+. And that is just the GPU … with a CPU lower in performance in the HMD, I don’t believe can get you to the same level of greatness in VR. Yeah mobile won’t be the same overall quality as PC attached– and pc attached won’t be able to deliver the same experience as a full VR arcade/park thing. But you probably aren’t able to invest in a solo VR park in your backyard. And I am not able to justify the expense of buying a pc with high end graphics card *just* for VR when, given my lifestyle, I would only have an opportunity to use it for maybe like twenty minutes to an hour once every few weeks or so. 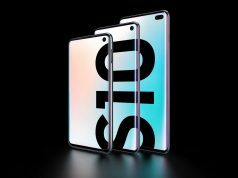 So– I want someone to come out with mobile with 6dof and I’m more than willing to accept the lower quality limitations it will have. VR Industry: stop teasing, please, and just hurry up and put some sort of mobile vr thing with 6Dof on the market already. I grow weary of waiting.